A couple years ago, Mr Doug Wells, of Harbour Breton on Newfoundland's south coast, sent me a series of articles on local culture, thinking the ones concerned with strange phenomena might be of interest to me. According to the Dictionary of Newfoundland English, a weather light is a gleam or flicker of light at sea thought to presage a storm. The Dictionary gives a few examples of how the phrase is used. P. Delaney of Tor’s Cove is quoted as saying, “when you can see [weather] lights on the salt water at night, it is a sign of a storm ahead,” while E. Cokes of Head Bay D’Espoir is quoted as reporting that “weather lights in the riggings of a schooner is the sign of a storm coming. The lights start at the bottom of the riggings and move gradually up to the top where they disappear. Lambert documents two examples of this luminescent occurrence from the communities of Miller’s Passage and Harbour Breton. A similar weather light was also seen in Harbour Breton. Lambert also references a man by the name of Mr Joshiah Bullen, of Harbour Breton, who could vividly remember seeing the dirty weather light, both as a boy and as a married man. Mr Bullen noted that once houses were built in the area, the light was never seen again. 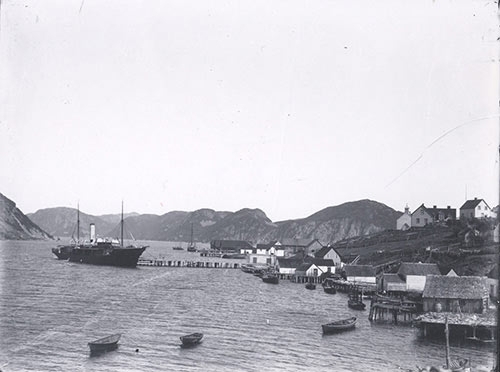 Photo of Harbour Breton from the collection of Doug Wells.